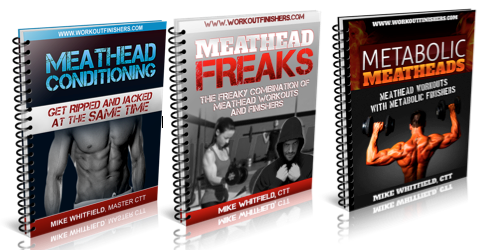 With these 90 days of Meathead Programs, you’ll discover cutting-edge workouts that use the latest research and advanced training methods so you get leaner and you build more lean, jacked muscle that will turn heads… all at the SAME TIME. But hurry, because your chance to save BIG one these programs that were once offered to ONLY Finisher Freak Members won’t last long. Men and women with an average age of 62 performed a strength training circuit 3 days per week for 12 weeks, gaining 4 pounds of lean mass while losing 4 pounds of fat mass. No changes in diet. No addition of interval training. Reference: Am J Clin Nutr. 2007 Apr;85(4):1005-13. Resistance training and dietary protein: effects on glucose tolerance and contents of skeletal muscle insulin signaling proteins in older persons. Iglay HB, Thyfault JP, Apolzan JW, Campbell WW. You combine the power of heavy lifting with “just enough” metabolic conditioning and metabolic finishers. 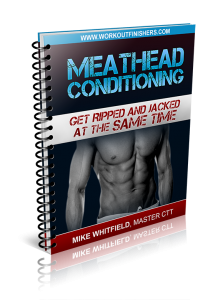 Advanced training methods like this are found inside all 3 of these “1-2 Punch” Meathead programs. So, you’re about to prove them wrong. The ultimate combo of old school lifting and metabolic conditioning mixed right into one amazing workout after another, you’ll love the upper body pump you get in Workout A. Not to mention perhaps the most evil lower body superset you’ll ever do to create muscle damage and a metabolism that will be cranked for hours. You’re going to have a love/hate relationship with the new 20-10 complex after an upper body superset that will make your shoulders, triceps and biceps pop. You haven’t seen anything like this before. The feedback on this has been amazing. A wicked combination of old school 5 X 5, meathead training and new muscle finishers, you’re going to improve your overall fitness while putting on new muscle with this 4-week program. 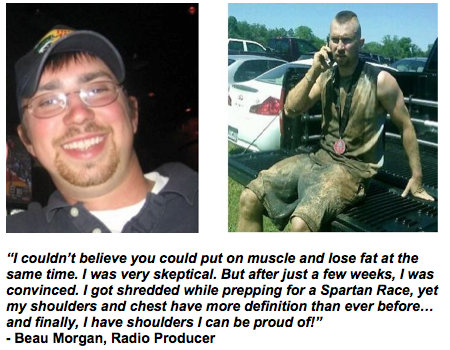 Want to focus on fat loss? You’ll get an optional day dedicated 100% to conditioning starting with a density superset. 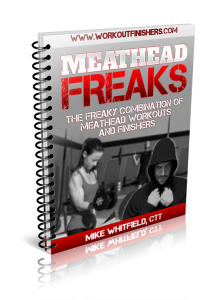 The advanced 4-day/week program that will crush your spirit with the latest advanced meathead moves, you’ll get a muscle-pumping combo of heavy lifting each ending with an anabolic finisher. The second workout alone will create roadmaps with your veins. You’ll pack on muscle in the main workout, torch belly fat with the finisher… the best 1-2 punch ever created. If you don’t like ANY of the workouts inside these hot NEW programs, we’ll let you keep the manuals PLUS we’ll refund every single penny back to you. If you don’t get the results you’re looking for AND have fun with these, I don’t want your money…. PERIOD. So give these workouts and finishers a full test drive for 60 days and if you don’t like them for any reason, I’ll refund your investment with no questions asked. 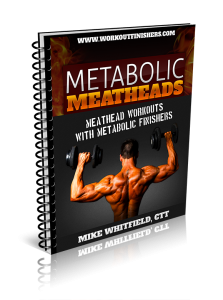 PS – Expect eye-popping muscle and drops in belly fat with all three Finisher Meathead programs, and save 78% off the regular price for a limited time. PPS – Remember, this is a limited time offer. These workouts were only available to the Inner Circle until now. You’ll hate to miss out on getting all three of these from the vault at such a big discount.